Coconut is widely used in food Industry within industrial food plants as well as at homes. Scraping coconuts is quite a time consuming task. Manually doing so requires a lot of efforts and is not so economical. 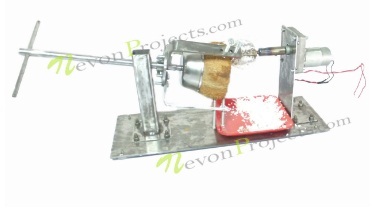 So here we propose an automated coconut scraping machine project. It provides fine scraped coconut as desired for food preparation and requires no manual effort. It also does this work in a fraction of time. The system uses a shaft with holder to hold half cut coconut in place. This holder shaft is held in place by mounts designed for it. Also a frame is made to hold the entire mechanism. On the other side has another shaft that is mounted horizontally with scraping tool attached to it at one end. At the other end it has a motor attached to the shaft. 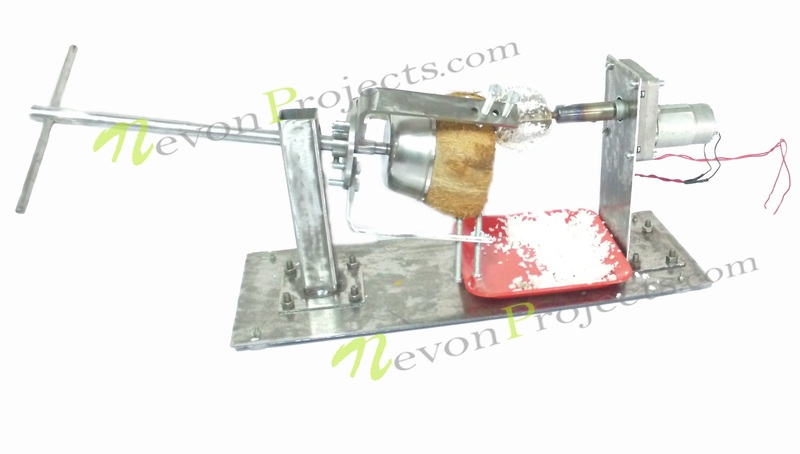 The motor is powered by our electrical circuit to move the scraper tool and the coconut can be pushed against it to achieve coconut scraping in a short time without much manual effort.